J 5th Floor spectacular oceanfront condo with large balcony access from living room & master bedroom. Two bedrooms have king size beds, the third room having 2 double beds.Living room sofa is also a double bed. Each bedroom has a TV, a new 60 inch flat screen T.V. in the living room. washer/dryer conveniently located in the hallway closet. A completely covered parking garage leads you directly to your door, NO ELEVATOR NECESSARY, so you can load/unload right from the car to the room in an enclosed air conditioned hallway. The Grand Atlantic has great amenites such as a heated indoor pool, outdoor pool, indoorJacuzzi, kiddie pools and a heated lazy-man river. And of course, step right from the pool to the sandy beach in less than 10 steps. Wireless internet, cable TV and dvd player also included. The Grand Atlantic is a complete year round resort, just minutes away from Barefoot Landing, Broadway at the Beach, Dixie Stampede, Carolina Opry, Palace Theatre, House of Blues, Ripley's Aquarium, Nascar Speed Park, waterparks, mini-golf, and of course 100's of golf courses. There are also deep-sea fishing charters and casino cruises nearby. Tennis and basketall courts in public park within walking distance. We are owners who pride ourselves on the TLC we give our condo to make sure it is always in great condition for you to enjoy & be comfortable in while on vacation! Living room 46 inch flat screen hdtv.Also T.V's in each bedroom. 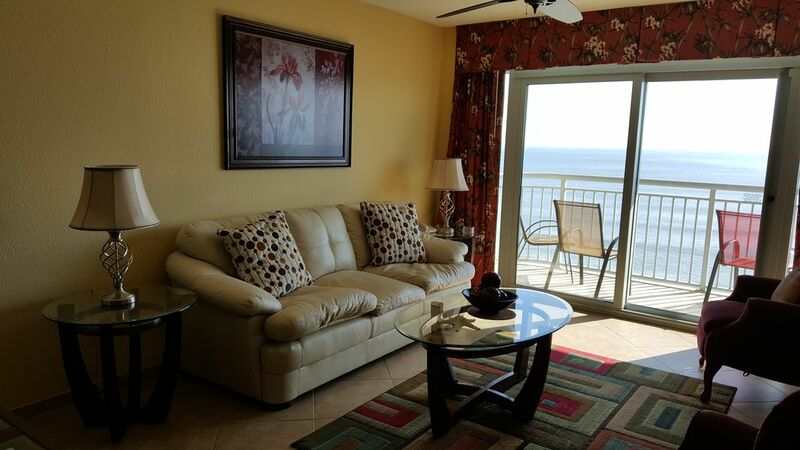 Awesome oceanfront 3 bedroom 3 bath condo located at the new Grand Atlantic. This unique building offers spectacular views of the Atlantic. Enjoy the year-round state-of-the-art water amenities this resort has to offer including indoor/outdoor pools, spas, lazy rivers, fitness room, and wireless high-speed internet access. Great location with family fun and close to all Myrtle Beach attractions. The condo was in a perfect location and exactly as advertised. The condo was very clean and had everything we needed to have an enjoyable stay. We loved sitting on the balcony. Parking and elevators right outside the door! Would definitely recommend this condo. The owners of this condo make our holiday a pleasant experience! after 11 years at the Grand Atlantic we moved to 502 and loved the location. park on the 5th floor and walk right in. the linens and kitchen supplies were plentiful and it was like being at home for the winter. dealing with Rose and George was a pleasure. answered our texts right away if we had any questions. supplies in closets for children on the beach are there too even tho we didn't need them. decorated lovely, plenty of balcony furniture when we have company. loved hearing the ocean while we slept. Very nice and great beach access. I would definitely recommend this condo and I will stay there again. Thank you George and Rose for your hospitality. Though our vacation was cut short due to hurricane Florence, the time we had in your lovely condo was wonderful. The kitchen is definitely fully equipped. The beds were all very comfortable. There were ample linens for all of us. And most of all working with you was a delight. You were so accommodating. The refund you issued us due to our mandatory evacuation was very generous. I highly recommend this wonderful condo to anyone looking for a home away from home. Thank you again George and Rose. We arrived to find a clean and well kept Condo. We enjoyed each sunrise on the spacious balcony. Such an added bonus for our family vacation that we are already planning to reserve this same condo for next years vacation. Such a beautiful place! We have been, and will be, recommending this condo to our family and friends. Minutes to all Myrtle beach has to offer, while enjoying the relaxation of not being in the middle of the busy boardwalk. Fantastic, convenient location !